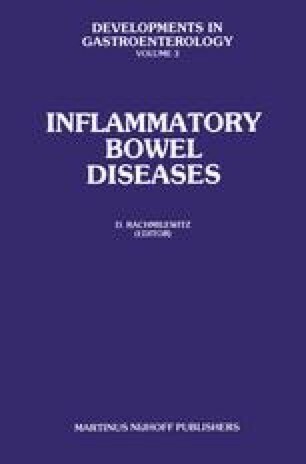 Ulcerative Colitis: An Autoimmune Disease? Although the etiology of ulcerative colitis remains unknown, it has recently been emphasized that immunologic mechanisms play an important role in the pathogenesis of this disease. Serum from patients with ulcerative colitis contain heterogenous antibodies that react with colon from newborn and adult germ-free rats, human intestinal and gastric mucus cells and Escherichia coli 014 antigen (1–7). Circulating immune complexes occur in patients with ulcerative colitis (8). Predominant IgG-containing immunocytes are observed in the lamina propria (9) and deposition of IgG and complement along the basement membrane of colonic epithelium in patients with ulcerative colitis (10) suggests formation of local immune complexes.